RANDALL, Private, ERNEST EDWARD, WX16356, A.I.F. 2/4 M.G. Bn., Australian Infantry. 12 September 1944. Age 36. Son of Edward and Martha Randall; husband of Jessie Randall, of Ajana, Western Australia. Panel 19. Please read about ‘A’ Force Burma, Green Force No. 3 Battalion. Ernest Edward Randall (Jimmy) was born Northampton to parents Edward Harrison Randall and Martha Maude Rodgers who married 1907, Northampton. The couple had a very large family and lived in Northampton. 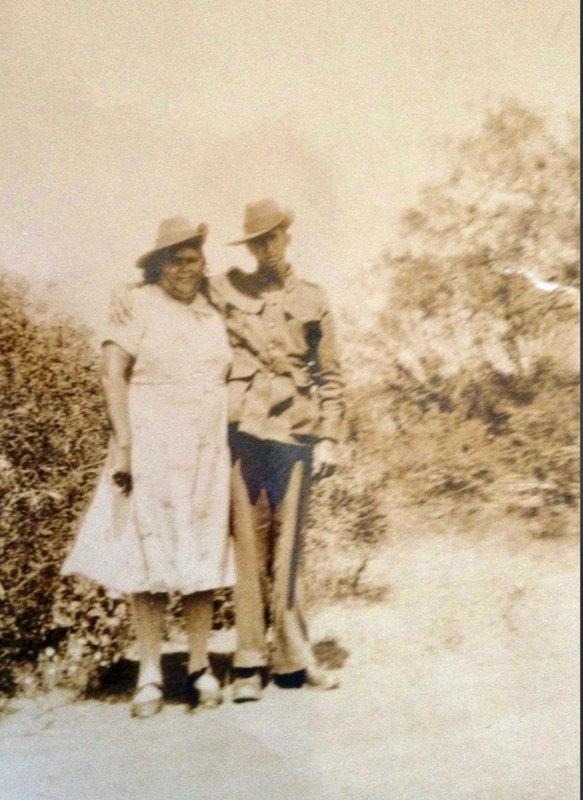 He married Jessie Oxenham about 1940 and lived at Ajana, about 50 km north of Northampton. Information received from Jessie’s descendants who spoke glowingly of Jimmy Randall, tell of Randall’s commitment to Jessie to marry before he left for war, ensuring Jessie would receive a pension should anything happen to him. Sadly there was disapproval from some of Jimmy’s family. Jimmy was his own man and he didn’t need their approval. Jimmy Randall enlisted 3 September 1941 and joined 2/4th MG Battalion’s ‘A’ Company along with with Cripps, Osborne and Sutherland. 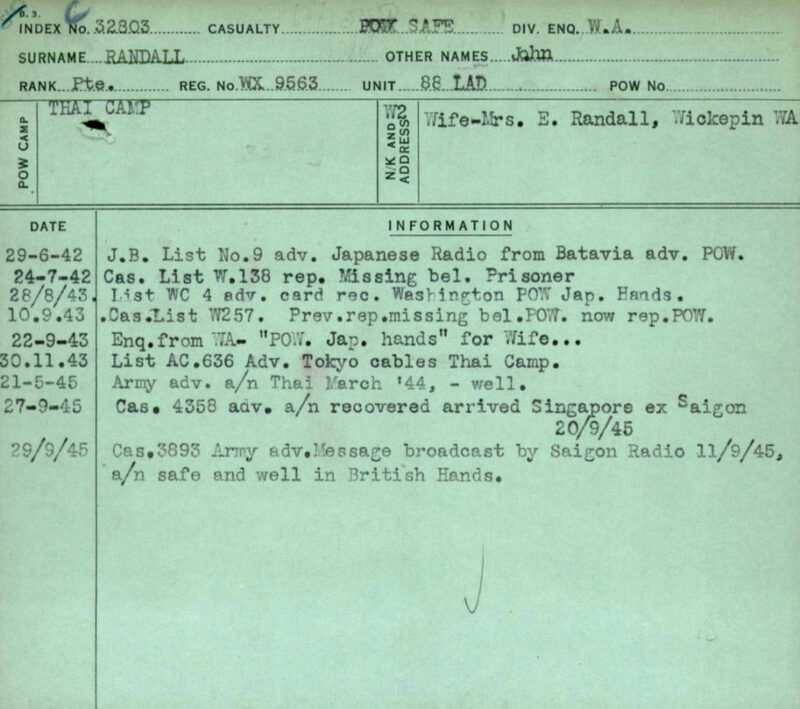 Having survived working on the Burma end of Thai-Burma Railway, the Japanese brought all the POWs south to Thailand. Jimmy was at Tamarkan when he was selected to work in Japan with what was to become known as ‘Rakuyo Maru’ Party. The party was sent by train via Bangkok to French Indo-China. The POWs eventually arrived at Saigon where they were immediately put to work at the docks. The Japanese intended to ship the POWs from Saigon to Japan. After some weeks it became apparent the seas around Saigon were unsafe due to the American submarine blockade. The POWs were then sent back from Saigon to Singapore by train. At Singapore they were accommodated at River Valley Road Camp where they were sent on work parties whilst waiting for a ship. Please read about ‘Rakuyo Maru’. Jimmy was 36 years old when he perished in the South China Sea in September 1944.